As you may have guessed from the title of this post, I am reviewing a lovely little shop which sells hair accessories called Bobblelicious! This Etsy shop sells the most beautiful hand sewn hair ties and clips - I seriously don't know how she manages to sew them so accurately. This lady is so talented! 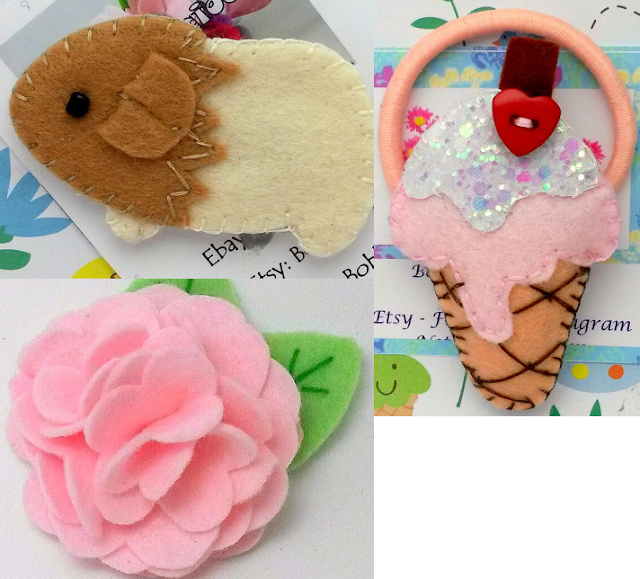 So I got a little guinea pig hair clip, a cute ice cream bobble and a felt flower hair clip. I love how the actual hairbands are matched in colour to their decoration as lots of places don't do this. The felt flower has a fabric covered alligator clip on the back so it won't snag your hair at all. They are just so beautifully made - I am actually gobsmacked by how neat they are. I also chose a glittery watermelon bobble which is attached to a beautiful mermaid-esque hair tie. And of course, if there was cupcakes on offer I couldn't possibly decline. How cute is this?! These hair accessories are so beautifully decorated - I am thoroughly pleased with my order, everything is so well made! Christine actually gives you the option of having them on bobbles or hair clips so you get your order customised according to what you like. Check out Bobblelicious on Etsy and Facebook.